I've always emphasized the importance that food and family play in my life, how my family and childhood memories influence my cooking. 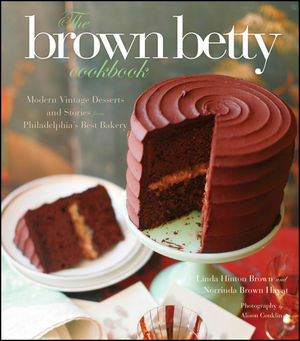 ﻿The Brown Betty Cookbook: Modern Vintage Desserts and Stories from Philadelphia's Best Bakery by Linda Hinton Brown and Norrinda Brown Hayat, a mother and daughter duo and owners of the Brown Betty Dessert Boutique in Philadelphia, PA, give new meaning to family-inspired recipes. Family is the common theme running throughout this cookbook. Most of the recipes are preceded by short biographies of the women that influenced the development of the recipe. You'll meet the most important people in the authors' lives - mother, grandmother, aunt, cousin, and mother-in-law - and you'll see how these women influenced these ladies into the bakers they are today. I enjoyed reading through this family tree and meeting these inspirational women and their recipes. The cake recipes include true classics such as Betty's Buttermilk Pound Cake, Sallie Marie's Sour Cream Pound Cake, Company's Comin' Coconut Cake, and Red Velvet Cake with Cream Cheese Frosting. But, you'll also find some recipes that sound a little more unusual but still tempting: Sweet Potato Cake with Spiced Vanilla Buttercream, Pineapple Pound Cake, and Nudie Chocolate Banana Cake with Blackberry Buttercream. Interestingly, it wasn't until after the bakery had been opened for a while that the authors developed a recipe for their bakery namesake, Apple Brown Betty. And, there are plenty of pie recipes to choose from in this chapter including the classic Sweet Potato, Lemon Meringue, Pumpkin, and Carrot Pie. Peach Cobbler and Sweet Potato Pudding are thrown in for good measure. In the final chapter, you'll be tempted by riches such as Double-Chocolate Cookies with Peanut Butter Chips, German Chocolate Cream Cheese Brownies, and the ultimate classic, Lemon Bars. If you're a fan of dessert cookbooks, you'll love this one. It's a beautiful book with lovely full-color photos of each recipes. Even though it is a hardback book, the binding allows it to lay open easily while you're using it. In a world overridden with cake balls and elaborately decorated cupcakes and cookies, it's refreshing to find a cookbook that celebrates vintage recipes and classic baking methods. You should welcome it to your collection. Pound cake is one of my favorite cakes to bake and to eat. 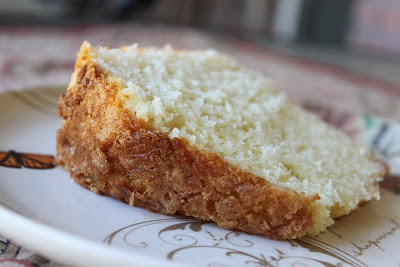 I'm always looking for pound cake recipes that are just a little different from the rest. 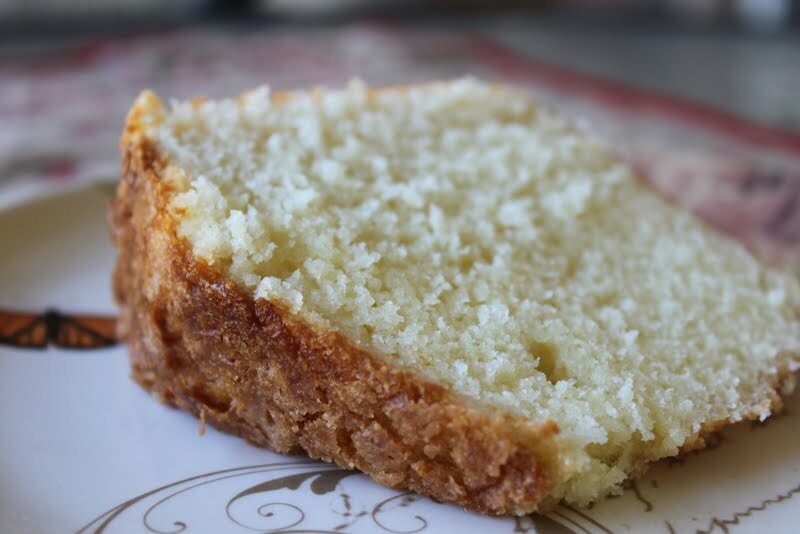 When I saw this recipe for Plain Cake, I knew I had to try it. It did not disappoint. It was rich and buttery and everything I expected it to be. While the recipe called for the cake to be frosted in vanilla buttercream, I chose to leave it unfrosted. It was delicious! Preheat the oven to 350 degrees. Coat a 10-inch angel food cake pan with nonstick cooking spray. In a medium bowl, whick together the flour, baking powder, and salt. In the bowl of a stand mixer fitted with the paddle attachment, beat the butter until light and fluffy and then add sugar on low speed until the mixture is light and fluffy, scraping the bowl as necessary, about 3 minutes. Add the eggs, 1 at a time, beating until blended and scraping the bowl occasionally. In a measuring cup, mix the milk and vanilla together. Reduce the mixer speed to low and alternately add the flour mixture and milk mixture to the butter mixture, beginning and ending with the flour mixture and beating until smooth. Scrape the bowl. Add the nutmeg and beat until blended. Pour the batter into the prepared pan and bake until a wooden pick inserted near the corner comes out clean, 70 to 75 minutes. Let the cake cool in the pan for 10 minutes before turning it out onto a wire rack to cool completely. To frost the cake, turn it bottom-side up onto a cake plate. The giveaway is open to my blog followers and/or Facebook followers. If you're one of my followers, please leave me a comment below telling me that you would like to win a copy of the cookbook. Also, please leave me your e-mail address where I can reach you if you're the lucky winner! I would love to win! I follow on Facebook! I'm originally from the Philadelphia area, so I especially want to win this cookbook. I follow on Facebook. ALL of your Cook Book Giveaway's I LOVE! HOW FUN! And this being a BAKING Cook Book, really makes me smile! Looks like a great one too! I want one! I need one actually! I would love to win this cookbook! I'm salivating just looking at the cake on the cover. Thanks for giving us a chance to win. I follow you on FB. I would love to be included to win. Oooh! It looks spectacular! :D I would love to win this. I'm going to have to try the plain cake recipes - looks marvelous! I follow you on FB and via GFC. What a fabulous giveaway - I'd love to win a copy of this great cookbook. Thanks for the opportunity to enter! This cookbook looks amazing! I am a cookbook collector and don't have one like this. Thanks for the chance to win. I'm one of your followers via GFC as nightowl. I'd like to win a copy of the cookbook. Love reading your posts and I would love to win! Baking is a passion of mine and I also love to collect cookbooks. I'll sit and read them like a novel! I would love to win this book! 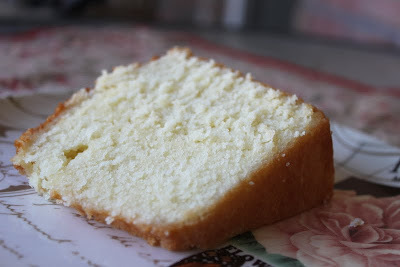 And I think I'll have to make this cake for my hubby as he loves pound cake! I would love to win. My Mom, who passed in September, both loved cookbooks! I follow you with Google Friend Connect and on FB! I follow on Facebook as Barbara Palermo. This looks like an awesome cookbook....sure hoping to win it and add it to my collection! I would love to win. Thanks. And that cake looks so good. I am an avid collector of cookbooks, and I would love to win this one to add to my collection! Looks like there would be LOTS of great recipes to try!! We would love to win your cookbook! Then, we could "well-season" all of the fabulous recipes! Thanks for the opportunity! In the event you need, you can email us at mrpetescajunspices@yahoo.com. Thanks again!